What’s All This Shamanic Stuff About? Four years ago I moved from a great storybook-style house property in the midst of a three acre compound in Los Angeles’ Franklin Hills area. Five other ’30s and ’40s era homes (including one occupied by actor Bud Cort), were situated in this strange compound. With the assistance of our former mate, Jodi Wille, we had many salon-type parties on this property, featuring filmmakers and writers like Ondi Timoner, Les Blank, Daniel Pinchbeck, Aton Edwards, Maja D’Aoust, Mel Gordon, and yours truly. The Feral House office was used in magazine shoots for its wicked witch look, and this structure was apparently used as an aviary for birds of prey by a former owner-builder. Why would this Feral man move from such a great place to the furthest reaches of the Pacific Northwest, more than a thousand miles North? The historical nature of the Franklin Hills property, and its meticulous upkeep by its owner prohibited such things as owning a dog and growing a vegetable garden. I felt like a very temporary occupant of someone else’s vision. Beyond this, Los Angeles felt haunted by a drought and polluted by a maelstrom of traffic, lights, microwaves and electromagnetic garbage. I’m glad that I made the move to trees, water, beasts, four seasons and a garden. People are starting to wonder, why would we release books like Raw Magic by Kate Magic, which describes the proper preparation of a raw food diet, and Shamanic Gardening by Melinda Joy Miller? Beyond our continuing fascination for strange cults, pop culture histories, political investigations and bizarre human behavior, we believe that citified humans have forgotten essential components of our animal nature and ways of keeping us alive when political structures collapse or natural disasters overcome the disintegrating systems in place. Process Media’s Shamanic Gardening book is, I think, an important one. It brings us back to Thomas Jefferson’s garden, Native American techniques and knowledge, and all the various plants that have not yet become degraded through Monsanto’s patented seeds and the horrors of agribusiness. 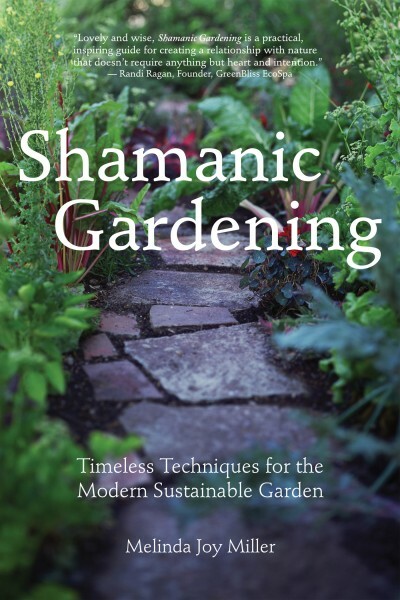 Shamanic Gardening provides a good bit of this essential knowledge in a delightful, illustrated way. You won’t know how much you will miss this essential knowledge until it’s too damn late.